For the last year and a half, I’ve been blessed to be part of a group called Write/Create. It’s a group that seeks to foster the creation of art (particularly writing) by Christians that is, first and foremost, high-quality and beautiful. It was such a godsend because I was hoping to connect with a group just like this, despite not really having (re)begun my writing endeavors yet. I had known Write/Create’s fearless leader, Ashley, for a few years because our daughters were in an activity together, but I didn’t realize she was involved with creative writing. One day, I asked her what was new, and she told me about the organization she was putting together. Of course, I was like, “How can I get a piece of that action?” And that’s how I came to be part of the writers’ group. It is such a fun, witty, helpful group of people, who spur me to get better at writing and take myself seriously as a writer. We have a million laughs and guac and chips whenever we get together for critiques. They have made me feel so welcome, and even though several of them are already talking agents and publishers, it lives up to its name as a group for writers of all levels. Write/Create is having its 2nd annual Advent Art & Writing Exhibit. It’s a collection of poems, paintings, photography, or other media that travels around to a few local churches during the Advent season. Last year, I did not get on the ball and was intimidated about submitting something, but this year, I submitted two poems. Ashley just sent me the above photo of my work on display at a local church. It feels good/crazy to see it all set up! Here’s a confession: writing is scary! Actually, it’s not the before or during part that’s scary; it’s the after, when you let people out in the world see the contents of your mind. The risk is that some of them might–no, some probably WILL–look right at what you’ve poured out of yourself and say, “Ew. Well. That was ugly.” Or embarrassing. Or “I had no idea her ideas were so weak and ill-thought-out.” And it’s right there on the page for all to see. It’s a feeling of exposure. So after I let anyone see my writing is when the difficult part begins for me because I second-guess myself endlessly. I suppose I had been postponing thinking about this aspect of submitting a piece. To see my poems on display just made stuff get real. But I guess that’s something anyone who wants to be a writer must overcome. After all, much like sportsball, writing is a community sport. I hope your Advent has been blessed, and that your Christmas brings you a lot of joy! 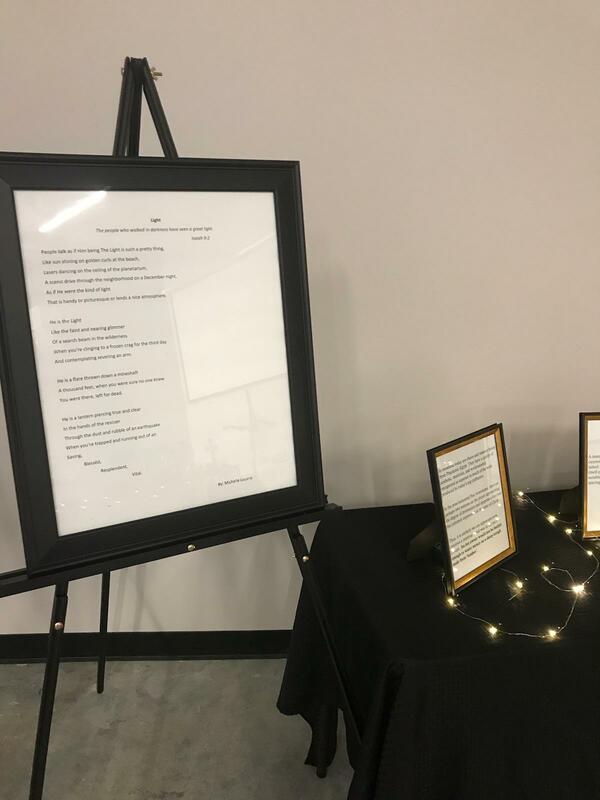 If you’d like to check out Write/Create’s Advent Exhibit, with several other great writers featured as well, it’s on view on Christmas Eve at Lifebridge Church in Cypress, Texas.